The recent Windsor On Ice was our 7th Christmas ice rink in Alexandra Gardens, sponsored by local companies: SMC Ford, Theatre Royal Windsor and Heart FM. This year was our most successful and busiest event yet. Opened on Gala Night, Friday 25th November, this corporate evening for our partner RBWM was a tremendous success. First on the ice rink that night were several new Ford models promoted by SMC Ford, followed by Anthea Turner who officially opened the rink and introduced the figure skating team from Berkshire Ice Rink. 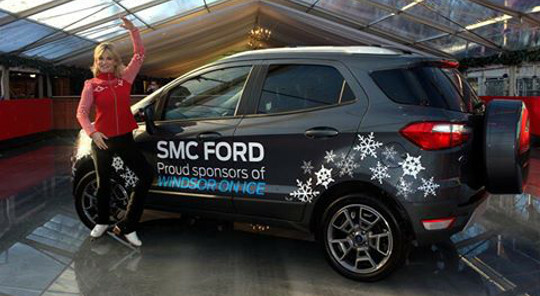 SMC were delighted to exhibit the Ford SUVs – the “Kuga”, the “Edge” and the “Ecosport” at the entrance to Windsor On Ice. They also had exclusive use of Windsor On Ice for a day in early December and the team and their families made regular appearances at the ice rink throughout the season with free skating tickets and VIP access. Anthea Turner, who was also star of the Jack and the Beanstalk at The Theatre Royal in December, said she “Loved being @WindsorIceRink” on Twitter and the theatre itself regularly helped to promote Windsor On Ice across their popular social media channels. We were also privileged to welcome other Pantomime cast members to the ice rink. Heart FM provided an excellent radio campaign for Windsor On Ice that promised to reach 183,000 people in the weeks before the Christmas holiday. We also ran a competition for a VIP Windsor Experience; a prize worth £500 that included a 4 star hotel stay in a “deluxe castle-facing room” and an all-inclusive visit to Windsor On Ice. Cotswold Outdoor ensured our staff looked impressive and kept warm in the outside areas with fantastic branded jackets with the Windsor On Ice logo, supplied free of charge. Our sponsors were each offered their logo on our website and promotional material as well as banners and advertising on large LED screens around the venue. Our on-site grotto was themed to publicise Jack and the Beanstalk at The Theatre Royal, and each sponsor received complimentary skating tickets for their staff. The event featured in several local What’s On guides and a kind offer from Clare, Operations Manager at Windsor On Ice, to allow the local skating teams of SPICE to train at the ice rink for free throughout December gained a wonderful article in the Windsor & Eton Express. And of course, the many happy faces we experienced at the venue and kind words mentioned on our Facebook page made all the difference to our success and the contentment of our team of staff at the ice rink. We would like to thank Murray Media for all of their hard work and help for this year’s Windsor On Ice, and also RBWM (the Royal Borough of Windsor and Maidenhead) whose support year-on-year at this stunning venue is hugely appreciated. We eagerly look forward to Windsor On Ice 2017 and invite you to contact us if you may be interested in sponsoring the event at the end of this year.